Cherry Blossom as Symbol: A Floral Science of the Concrete, a photo by timtak on Flickr. "The Science of the Concrete," (Levi-Strauss, 1966) is very much alive and well in Japan. Every spring beer cans and other products, otherwise unrelated to the seasons, are adorned with images of cherry blossom, and every autumn with red and brown leaves. Their beer cans are the nearest that many Japanese will come to the cherry blossom and autumn leaves but as a nation the Japanese are very keen on using nature - particularly flora - as symbols, for strength (e.g. see Miyamoto Musashi's book on swordsmanship, the Book of Fiver Rings, 2009), for the passing of time (e.g. this beer can) and for themselves (e.g. in surnames, Japanese heraldry or Kamon, national and regional flowers, and mountain cherry as a symbol for the spirit of the Japanese as in Motoori Nobunaga's famous poem below). I'll say it is the mountain cherry blossoming in the morning sun. Many years later Wasuji says that the Japanese spirit is the Japanese "climate" or fuudo (Mochizuki, 2006). This morning's Asahi Newspaper has an article by a professor at The International Research Center for Japanese Studies, Yousaburou Shirahata (2012), entitled "Why do we watch cherry blossom" (なぜ花見をするのか）, introducing several books on the history of cherry blossom viewing in Japan, as follows. Saitou (2002) records misgivings towards cherry blossom due to its use as a nationalist symbol during the second world war. One of the books that may have helped to create Saito's negative image of Sakura may have been Yamada book (Yamada and Yamada, 1990) on the history of cherry blossom and cherry trees in Japan. Satou (2005) records how a particular type of cherry tree, Somei-Yoshino, developed in the late Edo period was planted all over Japan and helped to unify the country by providing a marker, which sweeps up from the South to the North, of the arrival of spring. Nakao (1986) argues that while flower watching is carried out all over the world, Westerners watch flowers "instinctively" whereas in Japan a learnt cultural aesthetic of flower watching has developed. hirahata also references his own book (Shirahata, 2000), which I have just ordered from Amazon in Japan. I wonder if any of these books mention Yanagita's assertion (Yanagita, 1990, about page 214) that Shinto use to see the branches of flowering trees as a sacred sign, a precursor to the zig-zag strips of paper found at Shinto shrines, or the possibility that cherry was a form of deity and self-defining symbol in a floral 'Science of the Concrete." 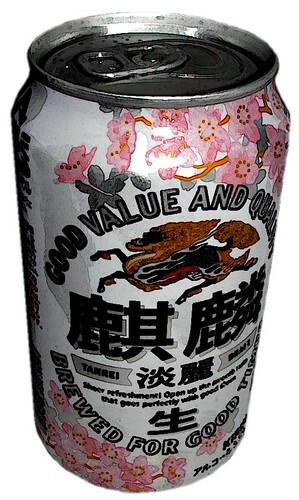 Beer can image copyright Kirin Beverage. Miyamoto, M. (2009). Book of Five Rings. www.bnpublishing.net. Nakao, S. 中尾佐助. (1986). 花と木の文化史. 岩波書店. Saitou, S. 斎藤正二. (2002). 齋藤正二著作選集 5 日本人とサクラ・花の思想史. 八坂書房. Satou. S. 佐藤俊樹. (2005). 桜が創った「日本」―ソメイヨシノ 起源への旅. 岩波書店. Shirahata. Y. 白幡洋三郎. (2012/4/9). なぜ花見をするのか ("Why do we watch cherry blossom", my trans）, Asahi Newspaper. p. 9. Shirahata, y. 白幡洋三郎. (2000). 花見と桜―日本的なるもの再考. PHP研究所. Yamada, Y. & Yamada. T. 山田孝雄, & 山田忠雄. (1990). 桜史. 講談社. Yanagita, K. 柳田国男. (1990). 神樹篇. 柳田国男全集 (Vol. 14).